We like to think of anti-aging as an exercise in health, not just beauty. Your body and skin will respond with glowing gratitude when you lovingly treat it with the most pure foods and earthly skin serums. 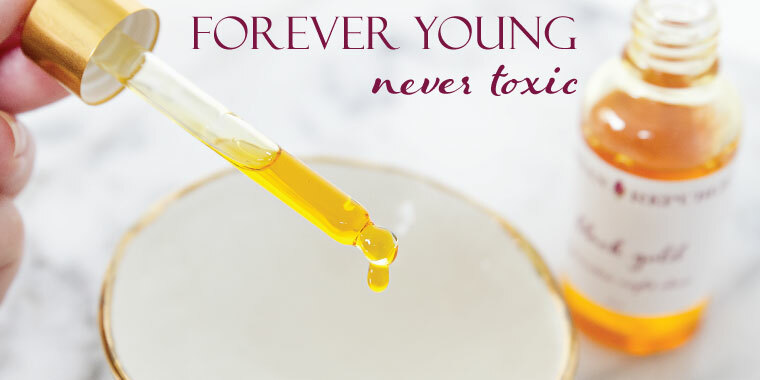 We have formulated our anti-aging serums with the most regenerative beauty oils on the planet, which not only renew your skin cells but also protect, heal, purify and soothe all skin types. Named for the marriage of Argan "Liquid Gold" and Rose oil, Argan Republic's Rose Gold Elixir combines Argan oil with nature's queen of the flowers, the rose. Rosehip oil and cherished bulgarian Rose Otto essential oil create a mighty, aromatic blend fit for the skin of royalty. This anti-aging blend is regenerative, wrinkle-fighting, and healing. Rose Gold elixir is perfect for firming and toning mature skin but suitable for all skin types. Let the best of nature erase your lines and nurture your skin. Argan Republic's Black Gold - regenerative night elixir combines our superstar, Argan oil with all of natures most regenerative, anti-aging oils. Exotic prickly pear is a potent anti-oxidant which perfectly compliments the rejuvenating effects of rosehip seed oil, sea buckthorn oil and pomegranate seed oil. For those of you who still get the occasional blemish, prickly pear takes care of that while you sleep. Your skin does all it's vital repairing and regenerating at night, always use this combo of vital oils to wake up with glowing, renewed skin!